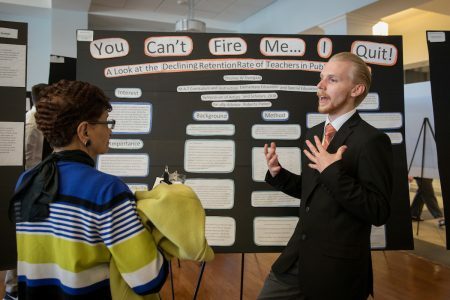 More than 50 Randolph students will present their academic, scientific, and creative research at the College’s 2019 Symposium of Artists and Scholars April 18 and 19. Modeled after a traditional academic conference, the event begins with a luncheon, followed by oral presentations, a keynote speech, readings of creative works, musical performances, exhibitions of student artwork, and poster presentations. This year’s keynote will be delivered by Karen E. Campbell ’77, professor emerita and former dean for undergraduate education at Vanderbilt University. She will give the lecture, “We Had a Splendid Suffrage Movement in Virginia: The Women’s Suffrage Movement at Local, State, and National Levels,” at 7 p.m. in Nichols Theatre, inside the Student Center. Student presentations begin Thursday at 4:30 p.m. in Nichols Theatre and continue through 5:15 p.m. Friday. For the full schedule and more information about the Symposium of Artists and Scholars, please visit http://www.randolphcollege.edu/research/sas/.